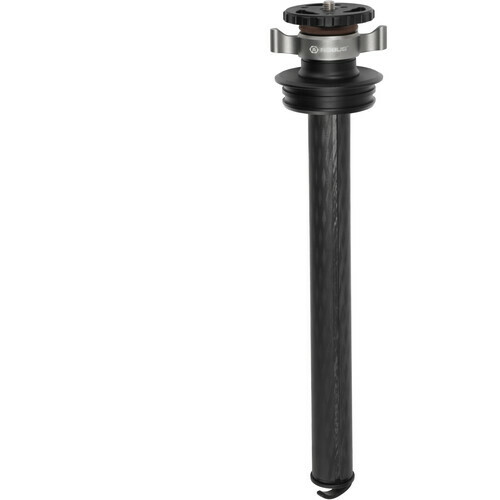 Column's Maximum Extension of 14.75"
Extend your horizons with the Robus CC-001 Center Column for Vantage Series 3 and 5 Carbon Fiber Tripods, which is compatible with the RC-5558, RC-5570, RC-8860, and RC-8880 models. The center column replaces the top plate of the tripod and locks into the yoke securely. Releasing the locking collar permits you to adjust the rapid center column to the desired height. Even with the column fully extended at 14.75", the 10x carbon fiber helps reduce vibrations that would otherwise cause camera shake. At the top of the column you'll find a reversible 1/4"-20 to 3/8"-16 stud and an integrated set screw that tightens against the bottom of a head to ensure that it not come off or loosen. At the bottom of the column is a counterweight hook to hang a small sand or camera bag for added weight and stability. Vantage Series 5: RC-8860 and RC-8880. The CNC-machined locking plate secures into the tripod's yoke, and the 10x carbon fiber reduces vibrations that would otherwise cause camera shake. The integrated set screw tightens against the bottom of the head to securely hold it from coming off the column. To add weight and further stabilize a tripod, a sand or camera bag can be hung from the counterweight hook, which is located on the bottom of the plate. Box Dimensions (LxWxH) 22.5 x 4.0 x 4.0"
Does this center column fit to Gitzo GT4552TS tripod?